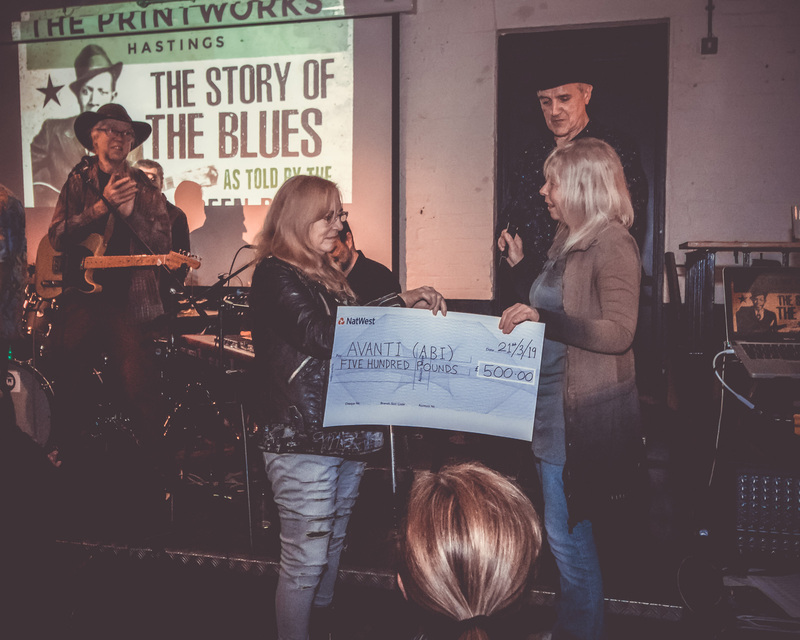 When the blues came down south to Hastings, it was time to reflect on the origins of the music that made such an impact on 20th century culture and remains a vital ingredient of popular music a hundred years further on down the line. In a multi-media event organised by the Green River Blues Band, the Story of the Blues was told utilising songs, narrative and historic film footage. The latter included shocking scenes that revealed the conditions black American slaves and prisoners suffered well into the modern era. 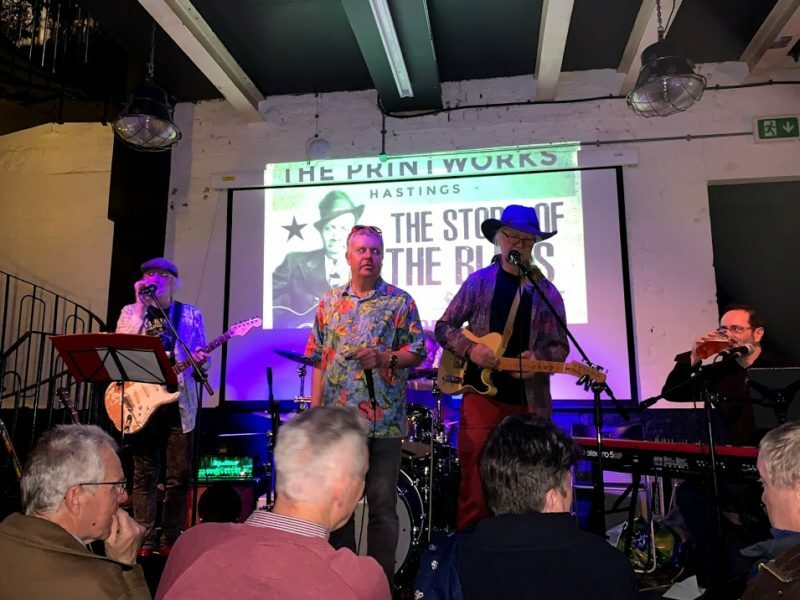 The audience at The Printworks, Hastings, itself a venue with an interesting history, were entranced by the two part show premiered on March 21st. Guitarist and singer Malcolm Stuart was joined on stage by fellow bandsmen, Simao Williams (keyboards, vocals), Malcolm Perrior (guitars, mandolin and vocals), Del Keighley (harmonica, vocals), Mark Stafford (bass) and Ron Mac (drums). Jonathan Linsley proved an excellent narrator. His articulate delivery and well prepared script ensured listeners were gripped by the flow of anecdotes and information that linked the songs by an array of blues composers and performers from Robert Johnson to Muddy Waters. It was fascinating to hear the underlying meanings of song titles such as Wade In The Water. It wasn’t about taking a dip in a hotel swimming pool. It was about the measures taken by slaves heading north to freedom and trying to escape the sniffer dogs sent in their pursuit. And Killing Floor by Howlin’ Wolf wasn’t so much a song of unrequited love as a reference to the horrors of the Chicago stockyards. The first part concentrated on the early days of slavery with songs and images screened behind the band that depicted life in the cotton fields and on the Mississippi chain gangs. The band played an acoustic set of tunes revived during the 1950s Skiffle Era, including Take This Hammer and Pick A Bale of Cotton. The irony of many of the lyrics was reflected in Blind Lemon Jefferson’s See That My Grave Is Kept Clean. The narrator told the story of Huddie ‘Leadbelly’ Leadbetter and his life of crime and punishment, before the group played On A Monday and Linsley described the grim facts of slavery, oppression and segregation. Robert Johnson, the most charismatic and nattily dressed of the latter generation of bluesmen, (his photograph graced the show’s programme), was famed for Crossroads that inspired Eric Clapton and a young generation of British blues revivalists. After Johnson’s heavily symbolic song came Some Day Baby and Sweet Home Chicago that pointed to a new future in the North for those escaping oppression in the South. Part 2 came alive with the heady exuberance of electrified Rhythm & Blues of the 1950s, with a lively Got My Mojo Working by Muddy Waters. “This was the golden era of classic urban blues,” explained Jonathan Linsley, recalling the Great Migration, and the part played by Chess Records in capturing the new sound. He also emphasised R&B’s increased popularity thanks to the Rolling Stones. The band moved into top gear, drawing cheers and applause for Smokestack Lighting, Big Boss Man, Mannish Boy, Little Red Rooster and amplified versions of Crossroads and Sweet Home Chicago. It was fun to see video footage of Mick Jagger and Muddy Waters performing together and another highlight was Malcolm Perrior’s recreation of Eric Clapton’s All Your Love solo from the Bluesbreakers’ 1966 Beano album.